The Georgian era provided us with some of the most innovative and intricate designs for interior decoration, and this is still popular today within the Door Furniture market. Here at Lockcentre, we aim to provide some of the finest examples and recreations of the Georgian Door Furniture designs made for your pleasure. There are 5 interior door handles (Euro lever lock, oval lever lock, lever latch, lever latch rose, lever latch round handles). 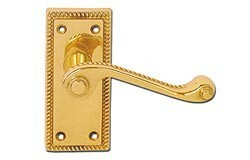 All of the Georgian Door Furniture Range are provided by the expert manufacturer, ASEC. Most of the products in this category come in a brass finish.